So, about one week later, after my first ever B’z dome concert in Osaka, which I was able to attend thanks to a friend from the UK, the fateful day approached. 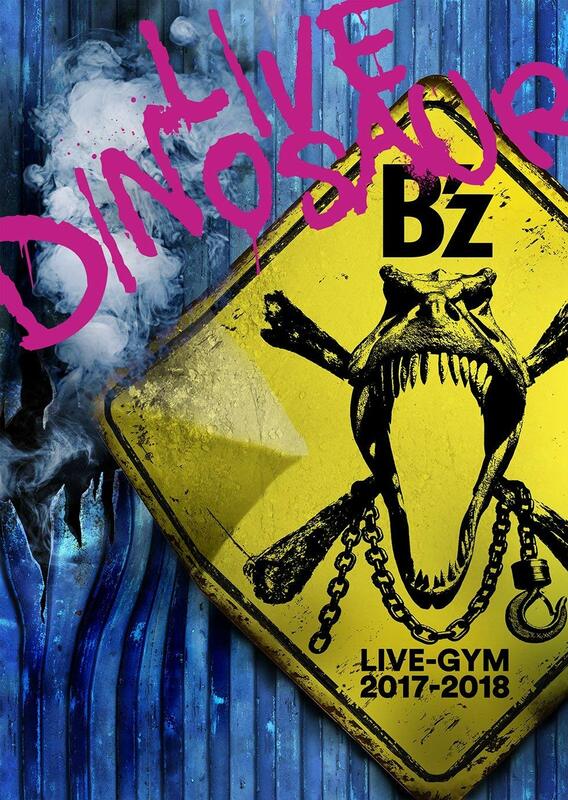 I’m of course talking about B’z 25th anniversary day: September 21st, 2013. 25 years ago, on that day, B’z debuted with their first single Dakara Sono Te wo Hanashite and their self-titled debut album B’z. 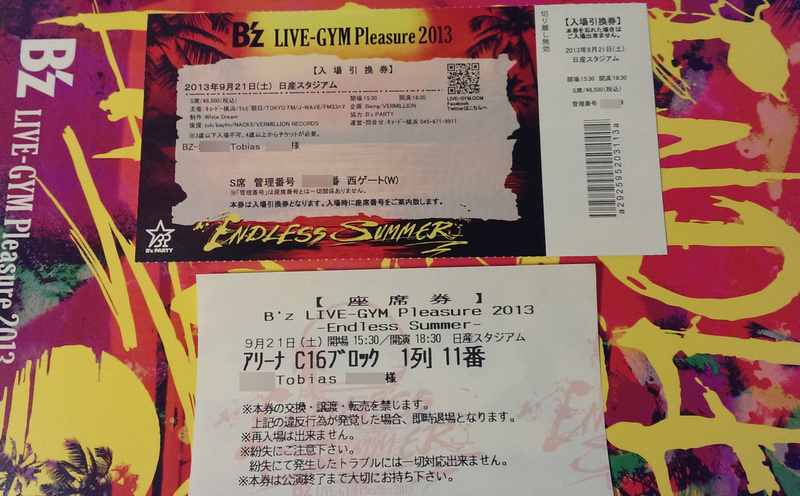 And right when B’z announced this 25th anniversary tour, I knew that I wanted to get tickets to the September 21st show. I just had to. Since I’m a member of B’z PARTY, the official B’z fanclub, I tried to get tickets through the fanclub exclusive pre-order, which by no means guarantees that you get tickets. You can sign up for tickets and hope that you get tickets to your most favorite show through a random draw. Luckily I got two tickets to the September 21st show!! 😀 Unfortunately I couldn’t apply for SS tickets as they involve thorough ID checking. Why two tickets, you wonder? Well, a friend of mine who currently lives in Belgium also wanted to go to said show, so I also got a ticket for him. And that’s the first thing I did in Tokyo: I met up with said friend at Tokyo station at around 10AM so we could make our way to Shin-Yokohama station, which is where Nissan Stadium is located. We talked about each other’s Japan trips and also a bit of B’z hype to pass the 40 minutes or so to get to Shin-Yokohama by local trains. I could have taken the Shinkansen, yes, but it was simply too expensive for me as I didn’t have the Japan Rail Pass. My friend had one, however. Anyway, we would soon approach Shin-Yokohama station and see that it’s already crowded with B’z fans everywhere. As it was just about lunch time, we went to a nearby convenience store to grab a delicious Bento since there are no shops around Nissan Stadium. 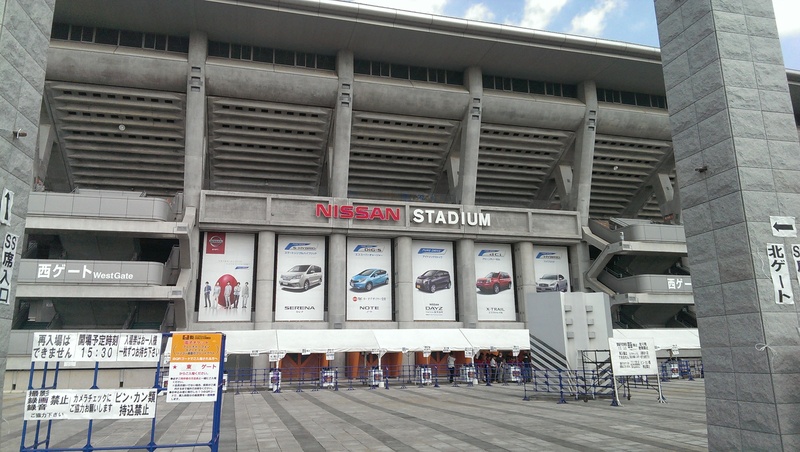 Afterwards, we made our way to Nissan Stadium in the heat (it was like 30°C) following the signs hopefully pointing us in the right direction. But we would soon spot a huge venue and knew we came to the right place. The stadium was about 15 to 20 minutes away from the station on foot. After eating our lunch, we made our way to the stadium so my friend could grab some B’z merchandise at the merchandise booth. We then went to the CD/DVD booth where I bought The 7th Blues and BREAK THROUGH, two albums I’m missing from my collection. If you were still missing some albums or singles, this is the place where you could buy them. They had every single CD out of the B’z catalogue for sale. Even the old 9mm singles! 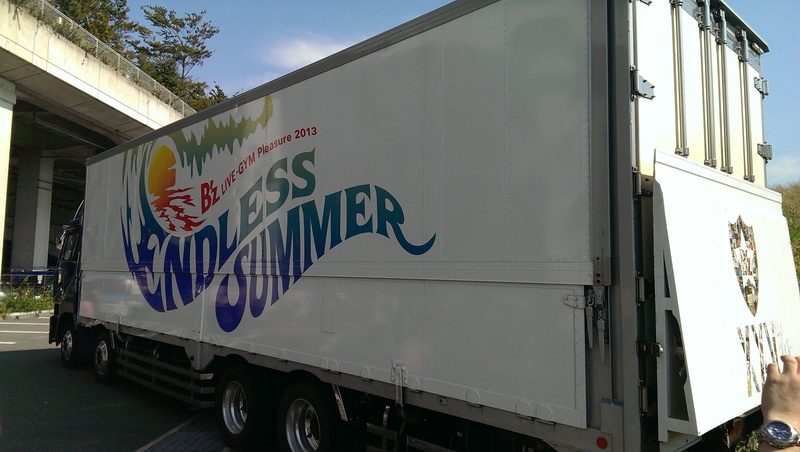 After that, we went on to hunt for the tour trucks as any true B’z fan would have done. A Japanese friend of mine told me they would be by the West gate, so we looked for the trucks in that vicinity and found them after just a little while. When we were taking pictures of the tour trucks, someone behind me suddenly asked “Tobias?”. As I turned around, I saw that it was a Japanese guy I knew online through the B’z group we have going on Facebook. He was also going to attend the show today, and he was so kind to arrange an offline meeting for members of the B’z Facebook group. We talked a bit and took a photo of him with the tour trucks in the background until we parted ways later as he had an extra ticket he wanted to sell. Now we had about 2 hours to kill until they would start letting people into the stadium and it was hot as hell, so we tried to find a nice place in the shades. We spent time talking and posting updates to Facebook, sharing the B’z hype with everyone, until finally, we were able to enter the stadium. If you don’t know yet, seats are not reserved but you are assigned a seat once you enter the venue. The staff will scan your ticket and hand you a receipt with your block number, row number and seat number on it. So if you are unlucky, you might still get a bad seat despite having an S category ticket. However, luck was on our side, and our seats were located in block C16, first row, which was very close to the stage, actually! 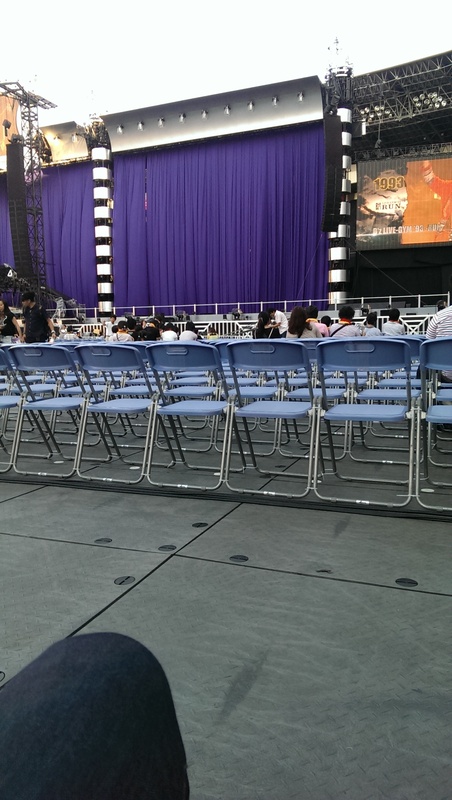 I believe the SS category tickets were in the blocks in front of us. Now all we had to do was wait for the awesome show to start. Just like in Osaka, they would show previous B’z performances on the big screens. The show was just about the same as in Osaka, except for two things: 1) They explicitly announced that this show is going to be filmed and we had one cameraman right in front of us! According to my friend, said cameraman even filmed us on a couple of occasions! So perhaps you will be able to see us on DVD/Blu-ray next year 😉 2) The set list is slightly different from the one in Osaka. Instead of TIME/ALONE, they played Sayonara Nanka wa Iwasenai/GOLD which is also a very nice combination but I preferred TIME/ALONE. And I think the band was even more enthusiastic than usual because they were filming the show, just so the final product will be awesome. But the hype doesn’t stop here. Since it’s B’z 25th anniversary day, the show closed with large fireworks which were very impressive! Koshi thanked us by saying that “There would be no B’z without you!”. After the show we made our way back to Shin-Yokohama station to get to the restaurant where we will have the offline meet with the other fans from the Facebook group. We had a great time there as we talked about our B’z concert experience and shared our thoughts on the different songs that were performed. LIVE-GYMs are always so tiring. My feet were hurting like hell. I was glad we could rest a bit and regain our strength in the restaurant before going back home. 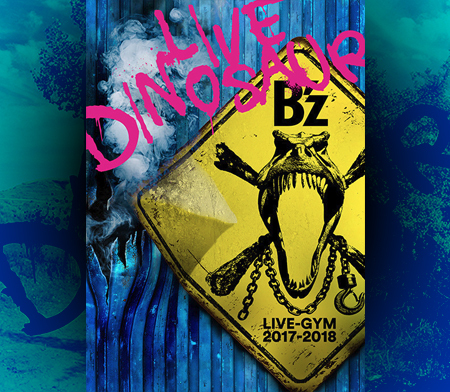 We will definitely do another meetup during the next LIVE-GYM!! Would you mind telling me the facebook group you are in? and do you speak very fluent japanese too? Lucky you, got good seats! I was all the way in the back of arena. For the first 7~8 songs did you notice sound problems from your spot? Cuz I did… not just me, fans around me have puzzled look or finger-plugged ears trying to hear clearly. It seems volume was a bit low and blurry. Not sure if you went to Sep.22 last day…. 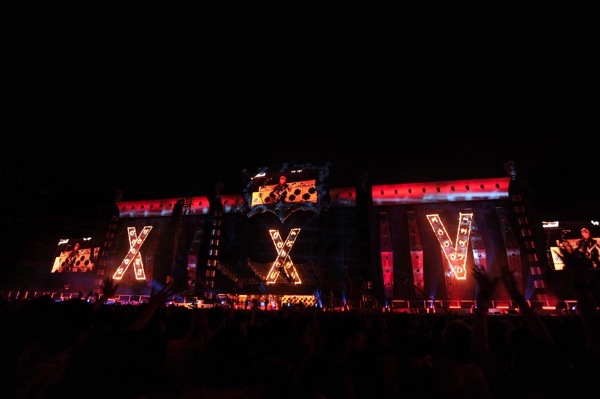 they have one-day only XXV t-shirt on sale… not even in B’z the store. Luckily I grabbed one before sold out. If you want to post on your site, leave me email. I take a pic and send to you. Hey there! Nope, I didn’t notice any sound problems. In fact, the sound was better than in Osaka. hi! i got one XXVI tee on 22/9 morning too and ,luckily, a signature plate on 21/9 as well. I’m kinda jealous you got to go… This setlist looks like every other Pleasure tour though and that’s disappointing. Props to Gold… amazing song and doesn’t get enough credit. Sort of really upset that Utopia wasn’t played… would have bought the live just for that alone. BTW! How is B’z in the STADIUM? Could you see the stage well? I mean… I had a vantage point in the US in a club from the second row… how was the stadium view?